My plans for the weekend were to have one quilt top finished - I did that, but not the one I planned to do. I went to my second lesson at Homespun and Beautiful on Saturday. Learnt how to make hassle free mitred borders. That was great!! Here is the quilt top so far - just one border to go. I am so pleased with the results. Unfortunately the colours in the photos just don't do the quilt justice. But it's an idea of what it is like. Close up of colours. Still not true!! Just one border to go. I was going to get this quilted on Sunday, but plans changed - as they do. We had a little visitor - 5 year old sister of two of the children we care for. Not a time to be locked away in a sewing room, so I stayed in the lounge room and made hexagons - still productive but not what I'd planned. 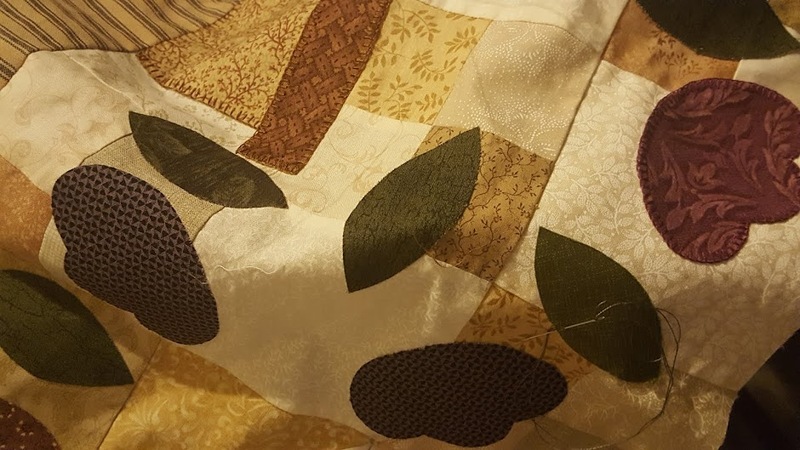 Yesterday - had plans to get back onto this quilt, but ended up doing some other sewing. Decided yesterday afternoon that I would start working on a raggy scrap quilt that had been cut out and waiting to go for some months. I finished it last night. I completed it by 8.30pm. My son was studying for his English assessment today and the topic was on To Kill A Mockingbird. We ended up watching the Dvd. I studied it in Year 11 - which was just a few years ago. So recall was a little hazy. While I watched I cut the edges. The picture was taken before it was washed and fluffed up in the dryer. That's where it is now! Once again, colours are probably not the best.This was made out of scraps - literally!! Just wanted to use up some of my stash. It's a great quilt for kids to use - not precious at all. Think I'll give it to our 7 year old as her special quilt. Very snuggly in winter!! So, it was a productive weekend - just took a slight variation on my plans. Worked on another quilt as well. Hopefully I'll have some photos of it tomorrow. It's one using machine embroidery and applique. My word you get a lot done! That quilt is absolutely gorgeous, Marg. And I love the scrappy one too, so cozy and cheerful! Good for you!